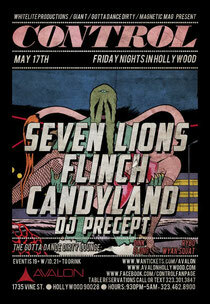 Seven Lions recently announced his first headlining Los Angeles gig at the historic Avalon Hollywood this Friday May 17 with Flinch, Candyland, and DJ Precept. As a producer of the new generation, Seven Lions continues to thrive in an increasingly competitive industry by deviating from the status quo with his authentic artistic motivations. In addition to his landmark Los Angeles gig, he will be playing at festivals such as Electric Daisy Carnival New York, Global Dance Festival, and Camp Bisco. Seven Lions’ emotive sound has led him to his widely-successful 'Days To Come' EP release on Skrillex's OWSLA label, numerous official high-profile remixes for the likes of Above & Beyond, Paul van Dyk, Matrix & Futurebound and others, as well as several other forthcoming collaborations. Additionally, he recently made his Ultra Music Festival debut and he was the main support on Porter Robinson's sold-out Circle Assembly tour earlier this year. In celebration of this show, Seven Lions will be releasing a new song, ‘Fever’, again, this Friday, May 17.